Formosan subterranean termite soldiers (red colored heads) and workers (pale colored heads). 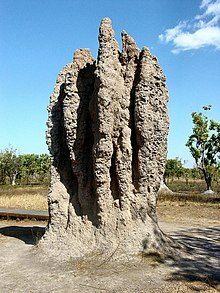 Termites are a suborder of social insects, the Isoptera. They are sometimes called "white ants", incorrectly, because ants belong to the Order Hymenoptera. Termites live in colonies that, at maturity, hold from several hundred to several million individuals. They are a prime example self-organised systems which use swarm intelligence. They use this cooperation to exploit food sources and environments which would not be available to any single insect acting alone. A typical colony contains nymphs (semi-mature young), workers, soldiers, and reproductive individuals of both genders, sometimes containing several egg-laying queens. Wikispecies has information on: Isoptera. This page was last changed on 2 October 2018, at 22:23.